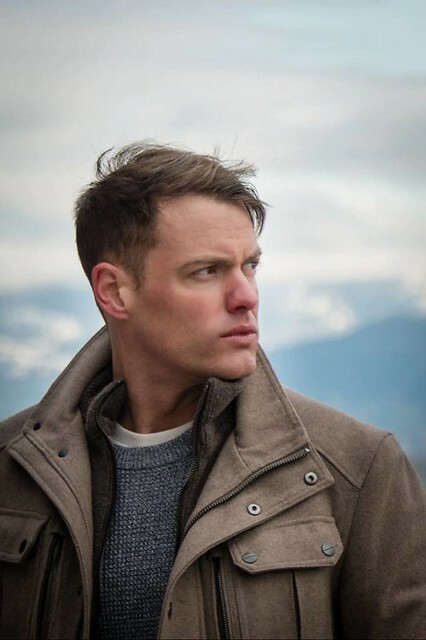 Lincoln Bevers is an actor who has made several short films since 2016, including Special Delivery: The Garageland Chronicles and Cam-Fusion. His latest movie is a starring role in Forbidden Power, written and directed by Paul Kyriazi. In this interview, Bevers talks with this writer about making Forbidden Power and more. Bryan Kristopowitz: How did you get involved with Forbidden Power? Lincoln Bevers: My agent contacted me and said “These producers in Seattle want to Skype with you. And soon. Can you do that?” I replied, “Give me 5 minutes.” Next thing I knew I was in a forty minute long Skype conversation with two producers and the director. Later that night they offered me the role. BK: How did you approach your character, George? LB: George saved my life. He was going through a major transformation. So was I. We got to know each other really quickly by having that in common. I also wanted to know the writer’s vision of who this man was. Again, George and I had much in common- minus the sexually transmitted powers, unfortunately. BK: Did you read the novel Forbidden Power before shooting the movie? If you did, how did the novel influence your performance as George? LB: I didn’t. I was cast one week before filming and things moved rather quickly. BK: What was Paul Kyriazi like as a director? LB: Honestly, the nicest guy ever. Somebody I’d seek advice from as a man. He’s a total guy, but has such a soft spot in his heart. He is spiritual and has love in his heart for people and the art of storytelling. BK: What was it like working with co-star Harry Mok, who also did the movie’s fight choreography? LB: Dude, he is sixty and could break me if he wanted to. He is solid. A great martial arts guru and passionate about what he does. And he’s funny as hell. We had a few laughs together, you know, the kind that make you cry. BK: What was the hardest part of making Forbidden Power for you? The easiest? LB: Being cast a week before shooting a full feature didn’t leave a lot of room with the dialogue. But Paul, the crew, and my co-stars had a ton of grace and provided immense support. The crew were phenomenal. I think that answers both questions. BK: Did you always want to be an actor, or is it something that you sort of came into later in life? LB: Always. At 7 years old I remember my Mom telling me “You’re such a good actor” as we walked into the store. I was being theatrical about something and she lit a fire with that affirmation. BK: What was that weight set made of, the one that your character lifted wholesale? LB: Ha! Well, a weight set, but also a car jack, I believe, and two prop guys to work it and hold it steady. BK: If you had the “Forbidden Power” in real life, what is the first thing you would do with it? Would you do something for the good of the world and humanity, or something “evil”? LB: Hmmmm… great question. Let’s say a mixture of both, as long as, in the end, I was able to use it to better us all. A very special thanks to Lincoln Bevers for agreeing to participate in this interview and to david j. moore for helping set it up. 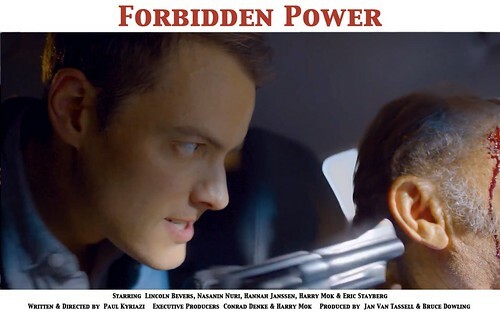 Check out my review of Forbidden Power here. Check out the Lincoln Bevers Facebook page here and Twitter page here. Lincoln Bevers head shot courtesy of the Lincoln Bevers Facebook page. All other images courtesy of Paul Kyriazi.